I had heard so much about Vegas. When I was planning my trip, I posted a question to my friends on Facebook about which place I should visit in the US if I had to pick just one? Most of my Indian friends said Vegas. "Vegas, Kamal. Trust me on this", said Vinay. 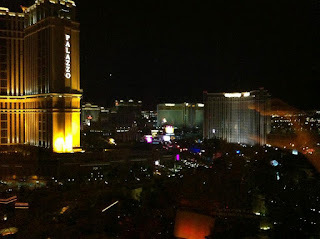 So, I finally included Las Vegas in my itinerary. Honestly, I had half a mind to drop it. Dori had said, "The last time I went to Vegas I didn't even bother to leave the hotel!" I am not a huge fan of casinos and big buildings and all that stuff. I wondered what I would do in Vegas. But then my parents and brothers also insisted I go to Vegas. You obviously know that Vegas is famous for gambling. The funny thing though is that there are gambling stations at the airport itself. So, people who go to Vegas to satisfy their gambling itch don't even need to wait till they get to the casino. They can start as soon as they land. Or gamble right up to the time they board the aircraft while leaving! When we arrived at our hotel, to my shock I saw that there was a huge line of about 50-60 people at the reception waiting to check in to the hotel. This was a first! A check-in queue at a hotel? WTF! Once we were checked in, we went to our room. Our room at the Wynn was just too good. It was on the twenty second floor and had a floor-to-ceiling glass on one side so that you could see the whole city from your room. We headed out the next day to see the famous casino-hotels in the city. 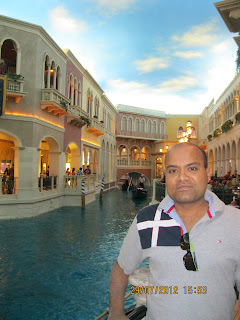 We saw the Venetian, Caesar's Palace, Palazzo etc. All magnificent structures. I was most impressed with the Venetian. They have a mini-Venice there complete with the waterways, gondolas and streets which have an artificial sky above which fools you into thinking for a moment that you are under the real sky! We were advised to catch one of the Cirque-du-soleil shows but we couldn't get tickets. So, we decided to go to the David Copperfield show at the MGM Grand. This show was really amazing. The final act involved picking thirteen people from the audience at random. Ten of them were put in a huge cage and three were made to guard the three sides of the cage - the front was visible to the audience. The cage was then covered with a sheet and then after a couple of seconds, the sheet was removed. The cage was empty! The ten people were found standing among the audience! There's something about the city that catches on. The vibrant atmosphere can be infectious. So, yours truly also well, kind of, you know.... well, we'll just leave it at that. For the great master Confucius say, "What happen in Vegas, stay in Vegas!" haha..nice post. Even I had same thought when I landed in vegas but I have not started from airport itself. Vegas make sures that you will loose some couple of hudred dollars and move out of the city, fortunately(if) someone gets then city make sures that you will loose at last in airport....whatever thats the most 365 days happening city.